While from recent reports it’s pretty tough out there if you are a photo equipment retailer, it seems that the top camera makers had solid financial results through 2017. Nikon increased profit on slightly lower overall sales in 2017. Nikon’s imaging business unit warrants special mention after turning in a full year result (April 2017 – March 2018) in which strong demand for the full-frame D850 professional DSLR has been a major contributor to the achievement of a 76 percent year-on-year increase in operating profit, even with sales down around 6 percent. Nikon as a whole – it also has significant healthcare, semiconductor and metrology businesses – enjoyed a 776 percent increase in profit – on sales 4 percent under the previous year’s figures! This follows a major change in direction from Nikon early last year which included announcing an extraordinary loss of several hundred million dollars, dropping its line of premium DL compacts, chasing profitability rather than volume, and introducing a voluntary redundancy plan. It appears the turnaround strategy is paying off. The Financial Results document stated: For digital camera-interchangeable lens type, there was an overall fall in unit sales, but sales of the D850, a digital SLR camera, which optimizes the combination of high resolution and high-speed performance, were strong, which boosted the sales of high-class cameras significantly. For compact digital cameras, efforts were made on the sales of high value-added products such as the high performance outdoor model Coolpix W300, but amidst the shrinking market, unit sales fell significantly. 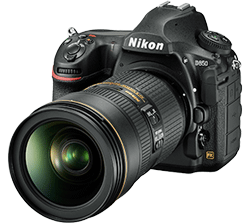 The successful launch of the Nikon D850 was a big contributor to Nikon’s turnaround in 2017 and reflects the new focus on high-end, high margin products. Canon meanwhile, is still spreading itself thin trying to maintain market leadership across all camera categories. As a result, revenue for the Imaging Products Business decreased by 5.8 percent year on year to 360,703 million yen. Operating profit, however, rose by 76.2 percent year on year to 30,222 million yen, due to the efforts to improve profitability through the restructuring, such as the shift to a business strategy of selection and concentration, and the discontinuation of operations of Nikon Imaging (China) Co, Ltd, a manufacturing consolidated subsidiary. We reported Canon’s 2017 results earlier this year. To recap, Canon reported a 61 percent growth in group net profit to 241.9 billion yen ($2.8 billion) for the Jan-Dec 2017 year. Digital cameras were a star performer, according to chairman and CEO Fujio Mitarai. Sales for the Imaging Systems business unit increased 3.7 percent year on year, while operating profit increased by 22 percent. First quarter 2018 results just out see Canon camera sales slipping 11.2 percent overall compared to 1Q 2017 and operating profit down 15.5 percent. Canon launched several new models including the mirrorless M100 during the quarter. Even though its first quarter was less than stellar, it forecasts its sales to be up by 1.5 percent by the end of the year and operating profit to be up almost 10 percent. Meanwhile, Sony continues to post good results both it its camera business and image sensor business. CFO Hiroki Totoki elaborated on the Imaging Products business unit results during the financials presentation on April 28: ‘FY17 sales increased 13 percent year-on-year and operating income increased 27.7 billion yen to 74.9 billion yen. The increase in sales and operating income was primarily due to an enhancement of high value-added products such as our Alpha series mirrorless cameras and our interchangeable lens lineup, the positive impact of foreign exchange rates and the negative impact of the Kumamoto Earthquakes in the previous fiscal year. In FY18 we expect sales to be 660 billion yen and operating income to be 75 billion yen, essentially flat year-on-year. A prediction of flat sales actually reflects a more positive mood at Sony than Nikon or Canon, who are both anticipating a slight reduction in camera sales this year. 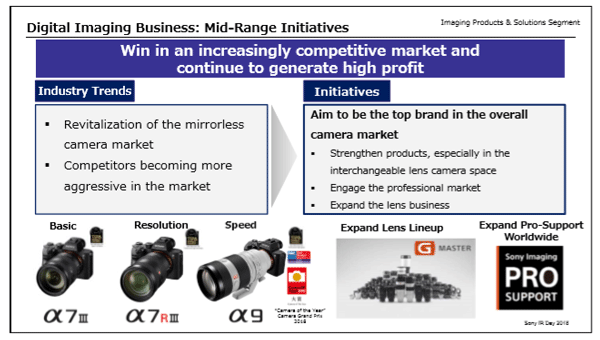 As with Nikon, Sony’s improved profitability is related to ‘a shift to high value-added models’. This is what the Sony CFO had to say about the Sony’s sensor business, currently said to account for about half the world’s production: ‘FY17 sales increased 10 percent year-on-year and operating results improved 171.8 billion to a profit of 164.0 billion yen. The improvement in operating results was primarily due to the recording of several extraordinary items in FY16 and FY17 and an increase in unit sales of image sensors year-on-year. 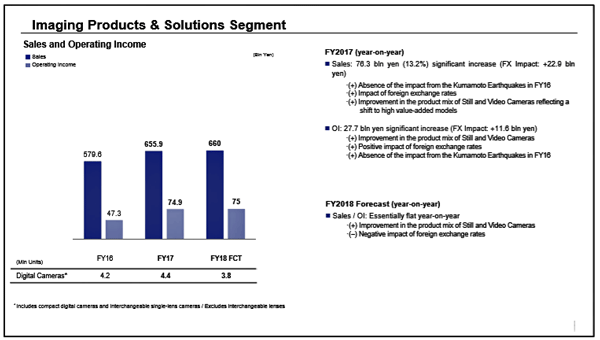 ‘We expect FY18 sales to increase 2 percent to 870 billion yen and operating income to be 100 billion yen. 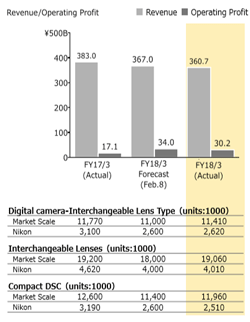 Although sales are expected to increase due to an increase in units sales of image sensors for mobile use, we expect operating income to decrease primarily because extraordinary gains of approximately 43 billion yen were recorded in the previous fiscal year and we expect the yen to appreciate compared with the previous fiscal year. Sony has followed up with verbal shots across the bows of its camera competitors. In a presentation this week it announced that its goal was to ‘be the top brand in the overall camera market’ by March 2021. This would involve knocking Canon of the perch it has enjoyed for a decade or more, at the same time overtaking a re-energised Nikon. Sony is also planning to invest 1 trillion yen over the next three years (over $12 billion dollars!) ‘mostly on image sensors’ according to Associated Press. Sony is in an enviable position. It has an unmatchable lead in sensor technology, and a massive market share. Two big breakthroughs delivering better image sensor performance – back-side illumination (BSI) and stacked sensors – are both from the House of Sony. Nikon uses Sony-manufactured sensors in most of its successful new releases – even if manufacture is based on a Nikon design. Canon also uses some Sony sensors, and has been getting poor ratings for its own sensor technology. (There are no Canon cameras in the top 20 as rated by DxOMark). ‘The Sony engineers who have been developing the revolutionary “Stacked” CMOS sensors to be found in the Pro α9 camera (and the latest consumer RX cameras) have been pulling proverbial rabbits out of the proverbial hats for a few years now – the impacts of which will change photography – forever,’ wrote photography lecturer, pro photographer (and Sony Global Ambassador) Mark Galer last year. Of course, making giant strides costs a lot in R&D investment. That $12 billion spend by Sony ‘mostly on sensors’ is going to make the agile newcomer a fast-moving target for its competitor-customers to catch up to.